Story by staff writer JM Merchant. Photos Copyright © Joanna Abram. GETTING BACK ONTO the little green bus after our stay at Tatapouri was difficult. We were all reluctant to leave our newfound patch of paradise, but we knew there were more wonders to come. 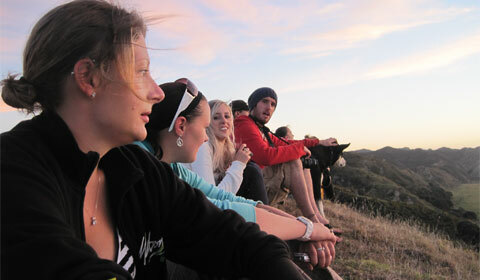 We were traveling with Kiwi Experience, an environmentally responsible tour company based in Auckland. “East As” is the nickname for their three-day route around the East Cape, featuring primarily Tatapouri, Rangitukia and Te Kaha. Our driver for the East Cape section of our NZ adventure was a little old Maori man called Walter. As we traveled up State Highway 35 he tried his best to teach us a traditional Maori song, Pokarekare ana, a tale of the Maori Romeo and Juliet. Suffice to say we weren’t very good students. One experience that Kiwi Experience are very proud of is the opportunity to visit the two marae at the Whangara settlement. A marae is the traditional meeting house of a Maori tribe, where the people can come together to talk and learn, sing and dance. It’s also where they bring their dead, to allow all that loved the person to mourn. Sadly, the day we were to visit was the day of a funeral, and we weren’t allowed to enter the site. The Maori mourning traditions are very healing. 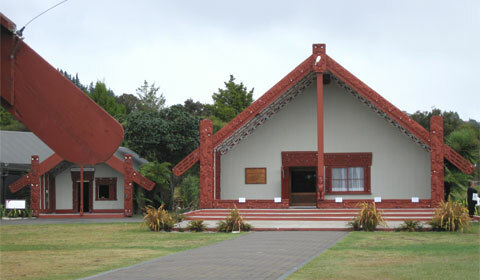 The body is laid in the marae and all and any who want to come to weep and wail their grief openly, enlightening each other of the deceased’s virtues and faults, encouraging the spirit to return to the traditional homeland of Hawaiki, singing and joking while watched over by the deceased’s female relatives. The body is not removed until all present have said their goodbyes, sometimes taking several days. The mourners hold an overnight vigil and at sunrise the coffin is closed and taken for burial. After taking a long and winding dirt track, we came to the Eastenders farm stay late in the afternoon. 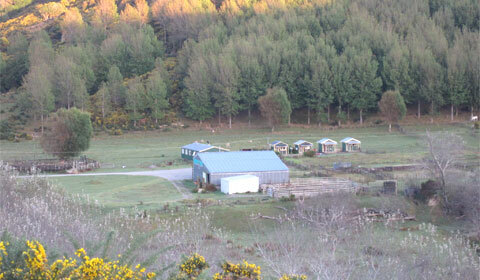 In the photo below, the big building is the wool shed, the building directly behind it is the cabin where we slept and the four sheds are the guest chalets. We were greeted by the farm dog, Jess, and other guests who were staying in the chalets on the farm. We dropped off our bags in our dorm room before bounding up the stairs of the old wool shed, affectionately dubbed The Nightclub. I really wish I had a photo of the inside of this building because it was so quirky! There were glass bottles of all shapes, sizes and colours lining the windows and their caps adorned the walls. Every type of Kiwi beer must have been represented in that room. There was also a fridge of full beer bottles, a ping pong table and an old pool table. But we were up there for something more constructive than drinking and play. We were up there for bone carving! We met Tom and Kizzy, our instructors, who presented each of us with a small chunk of beef bone on which they had pencilled our chosen traditional designs. They guided us through the sawing, the drilling and the filing, and then we must have spent at least half an hour sanding and polishing our carvings under cold water until they gleamed! Small holes were drilled in the top of each and threaded onto wax string so we could wear our new talismans proudly. While in Tatapouri, I’d picked up a beautiful piece of paua shell off the beach, and Tom was kind enough to drill this and add it to my necklace. 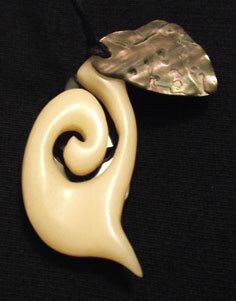 My carving incorporated two different Maori talismans. The spiral is the Koru, representing the young fern frond opening; thus new beginnings and regrowth, as well as peace, tranquility and spirituality. Then there was the fish hook, or the Hei-Matau, for safety when traveling over water—something I suspected I’d need at some point on my trip. It also represents strength, prosperity, abundance, authority, power and a great respect for the sea. We spent the remainder of the evening out in the yard around the fire. A couple of the lads had guitars and we got to singing all sorts of songs before turning in for an early night. The next morning I woke up late. Well, later than I’d intended! 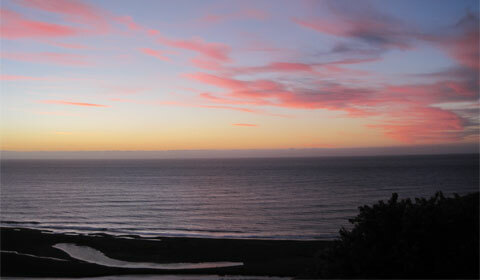 One of the East Cape’s biggest selling points is the sunrise. 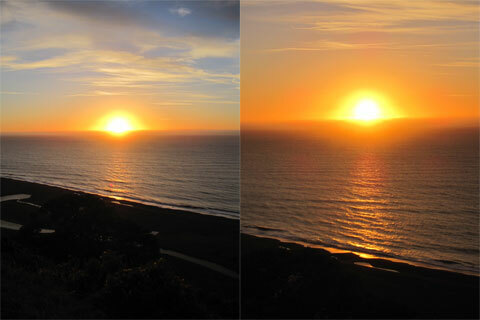 After Tonga (and since New Year’s Day 2012, Samoa) New Zealand is the first country in the world to get the rising sun. Rangitukia is so far east it’s one of the first parts of the country to see the light. So we all decided that we would rise at dawn to go witness the spectacle. I overslept slightly and had to make my way up to Sunrise Point alone. We’d been informed that Jess the dog was the best guide up to the point and would be more than willing to take us up there, besides being the only staff member awake at that time. As I stumbled bleary-eyed onto the dirt track, headed for the hills, I spotted a dark figure down the road. I was convinced it was Jess come back looking for stragglers until I got up close and it mooed at me! Of course it was a young calf that had managed to wriggle through the fence and gotten separated from the herd. That encounter certainly woke me up. After a 15 minute climb up a few steep hills and through prickly bushes I joined the rest of my friends overlooking the sea. Another guest of the farm was meditating on the next hill over, Jess sitting attentively at his side. Jess got bored with meditating and decided to join the party instead! Though the sun wasn’t yet up the sight was phenomenal. 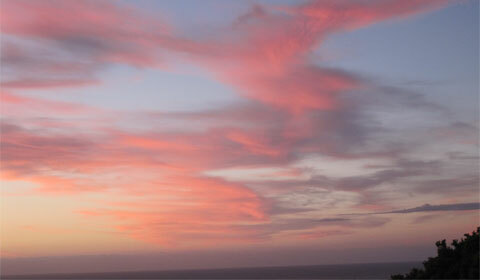 Wisps of pink-stained clouds hovered above the water as the blue sky began to take on an orange tinge. We spent some time trying to guess which part of the horizon the sun would eventually peek over but, overall, there was an air of peace and contemplation. Despite the fact that you know how slowly the sun moves across the sky, I still expected it to explode over the horizon to dazzle us all. So the thrill and tension of watching it creep into sight was palpable. Of course you’re not supposed to look directly at the sun, but when you’re watching that great fiery orb practically emerging from the water you can’t help it. As it gradually rose higher all the colours of our surroundings came to life and the trek back down to the farm was breathtaking. 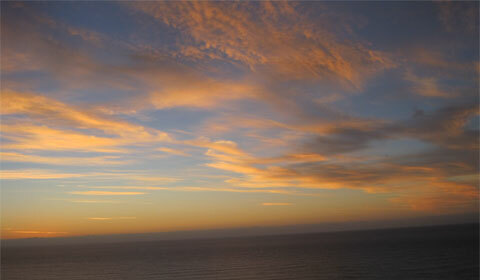 Astonishing how bright it is before the sun even starts to get over the horizon! 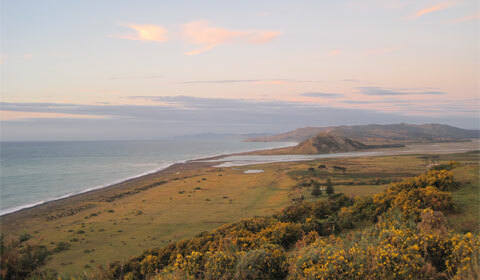 The hills below are a beautiful example of the North Island’s landscape, which was formed primarily as a result of volcanic activity—as opposed to the tectonic plate movements that formed most of the South Island. It wasn’t long before we were back on the little green bus after saying goodbye to our hosts and new friends at the farm. It was on to the next stage of our adventure! 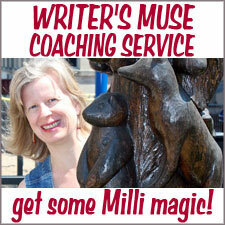 JM Merchant (or Jo Abram to most) lives in the North End of London, although she aspires to the West End. An occasionally employed sound engineer and stage manager, most of her time is currently spent reading pirate tales as she works on her first novel. She blogs and posts short stories at Am I A Writer Yet? and tweets as @JMMerchant86. Amazing photographs and suspenseful story too! The sunrise leaves me speechless! I love the quaint Eastenders farm stay and your lovely bone carving creation. I’m not usually a tour bus traveler, but those tours on little green buses in that part of the world are special. (I experienced them in Australia) I went to Kiwi Experiences link in your story, looks like fun! Kiwi Experience are a lot of fun, the drivers are great, always ready with information on the area you’re driving through, and they’re all such characters that you never get bored of learning new things from them. A great story and stunning pics. Having spent some time in NZ, I can vouch for what was shown – stu-nnnnnn-ing. Jo! shall we reveal what is not said about Rotorua. The Sulphur smell from the springs. It’s everywhere. 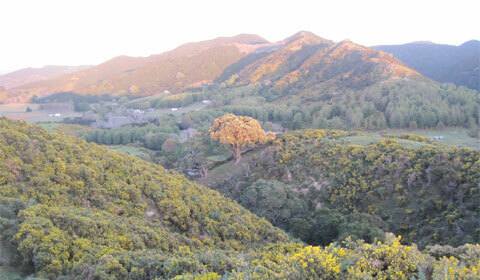 However, that does not detract from the beauty of the country. Even boring old Wellington grows on you. Tres enjoyable, Jo – glad you could join us down under. Can’t wait for the first opportunity to get back there. I’ve had the pleasure of being to New Zealand a few times now and I keep going back. Even though there’s just under 270,000 kilometres of the two and a half little islands, it seems like they have everything in the world. I have skied and surfed on the same day in New Zealand. Might have to check out Kiwi Experience on my next trip down there. Seems like you got a tour steeped pretty thick in culture. I’ve always appreciated how the Kiwis treat the Maori nowadays. I mean, sure, they got a pretty rough deal, don’t get me wrong there, but compared to how the Australians or Americans treat their indigenous population, I thought it spoke volumes about the Kiwis. Couldn’t agree with you more, New Zealand have it all. I’ll never forget standing on Franz Josef glacier and just 100 metres away was subtropical rainforest. I highly recommend Kiwi experience. 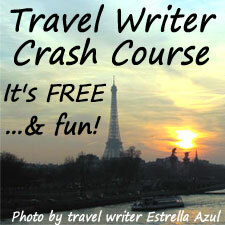 They offer such a variety of experiences, including a lot of the adrenalin sports but it’s all awesome! I’m so glad most of the country is now committed to regenerating the Maori traditions, they came so close to losing all of it less than a generation ago. Hi Jo, poetically written. Couldn’t have described the sunrise better meself! Loved Rotorua despite the smell. well dun. don’t remember seeing the beautiful carving? NZ is a place I would love to visit one day! 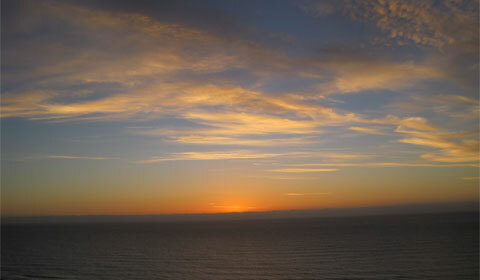 I think your sunrise is amazingly beautiful! I am sure the little hike in the AM was well worth it! It must have been a wonderful experience! What a fantastic trip! 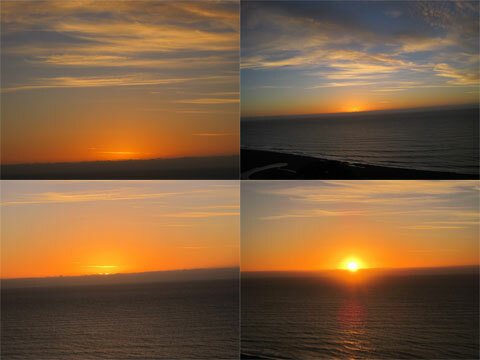 Your talisman is beautiful and the sunrise is stunning! 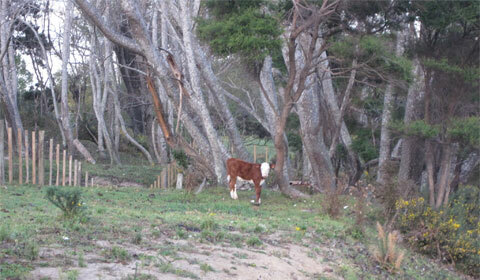 Thank you for sharing – I felt as if I were walking with you…along with the lost calf! It really sounded like a once-in-a-lifetime experience! I’m speechless over here (good thing I have to type my comment). This is absolutely amazing, the photos are stunning, and if I were there, I’d probably shove loving to sleep in and be out there watching the sunrise every morning!